I just put two and two together recently when I started getting more YouTube followers and comments on my YouTube videos on older content when I realized that Blog Engage now added YouTube syndication to their already comprehensive list of syndication features for bloggers. 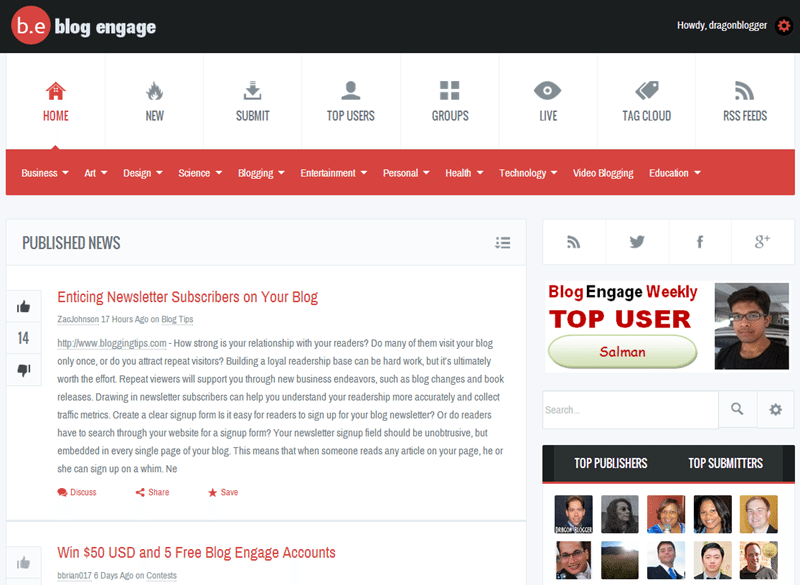 First let me showcase the new much faster and cleaner look of Blog Engage. The site loads fast and the weekly top user is showcased prominently on the right along with the top publishers. It is easy to navigate and voting articles up and down is also more responsive than in previous versions of Blog Engage. 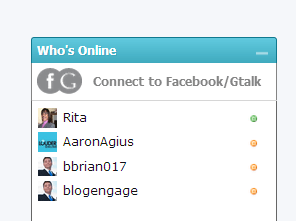 The chat feature to see when others are online and have a quick chat with them is also working very well. I often will leave my Blog Engage window open and will get the audible alert when someone contacts me asking a question or wanting to connect. 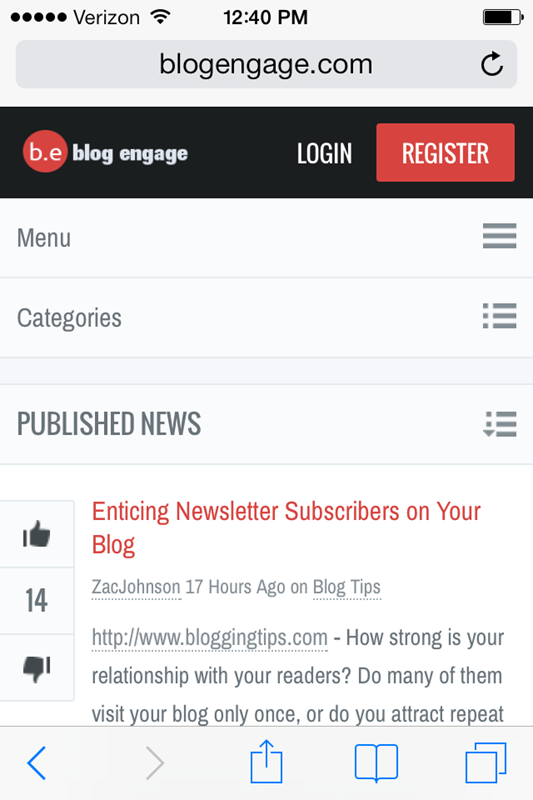 Plus Blog Engage now has such a mobile friendly interface compared to the previous version, it is clean, crisp and the above image taken from an iPhone 4S Safari browser shows how easy it is to navigate around. Now vloggers can really get in on the action and not only showcase their blog posts and RSS feed to the Blog Engage network, but their YouTube video content will now automatically syndicate so each video has increased audience who can watch and become potential fans and subscribers. The awesome thing too is when someone finds your video on Blog Engage, they can simply click on the play button and a window opens so they can watch the video without having to even leave Blog Engage. 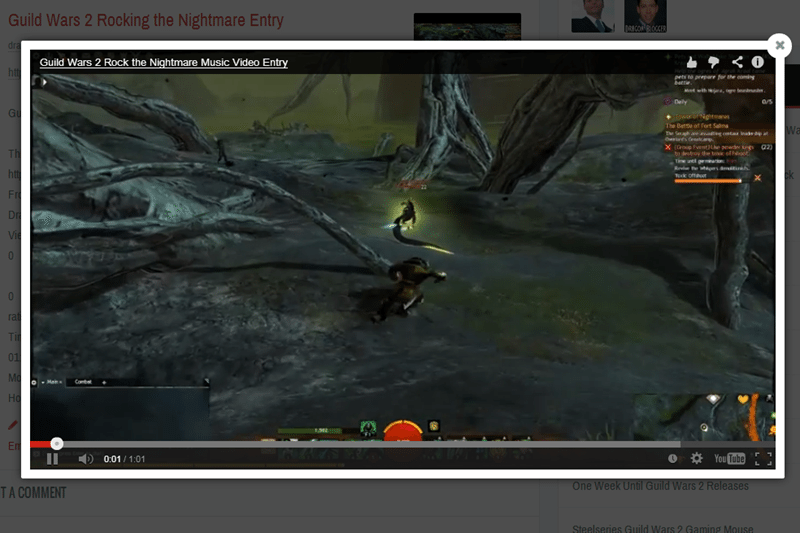 So once the video is finished they can go back to explore the other video blogging or articles they are interested in. BlogEngage itself gets nearly a hundred thousands views per month and has a network of over 3,000+ members. 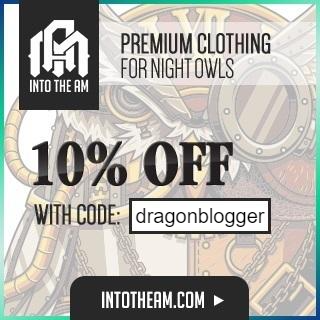 These are peer bloggers most of which have the same goals as you, increase awareness for their sites, articles and learn and share what they learn with others. In fact, Blog Engage has so much engagement it has lead to bloggers finding and networking with each other for partnerships, contests, giveaways and helped bloggers find and resolve problems such as hacks, malware, theme issues…etc. There is almost always someone responding to a comment on the Blog Engage Facebook Group and offering to help or share information. 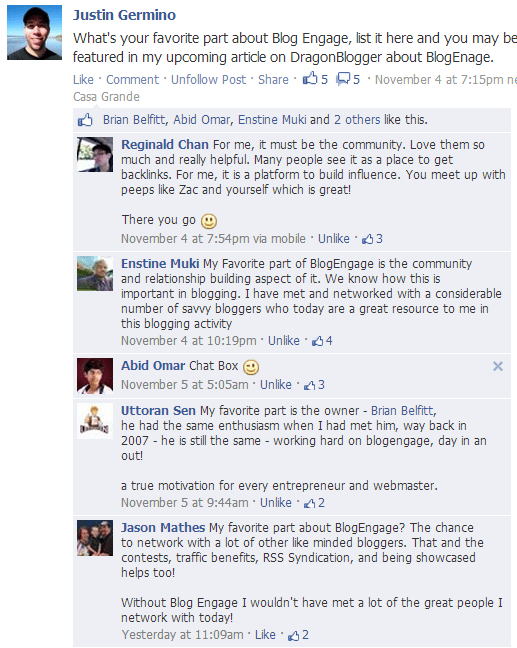 Just asking some peer bloggers on their favorite features of Blog Engage, and many like Jason Mathes from Average Joe Geek, Reginald Chan, Abid Omar from ABCD Blogging or Enstine Muki from EMFastIncome will say it’s the community or networking with others. And Uttoran Sen owner of Guest Crew like myself has known Brian for years and knows the passion he has for his business, though I met Brian back in 2009 a few months after I started Dragon Blogger. Blog Engage has several RSS Syndication Plans depending on your marketing budget and what kind of impact/reach you are looking for. You gain the most impact from the Direct to Front Page Marketing, which means every article or video entry you syndicate will immediately publish to the Blog Engage front page no matter how many votes the article has. This gets your content immediately right in front of the face of most visitors and users, because I tell you honestly that I first visit BlogEngage.com homepage and see what articles are voted there before I go looking at the New Category and I am betting that is the most popular trend. So where articles submitted may have a tendency to get hidden in the vast volume of other articles without doing some engagement and networking, Direct to Front Page bypasses some of the overhead involved in getting your content in front of other people. 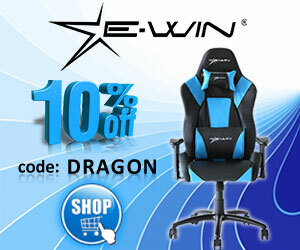 If you run a large online presence, then direct to front page is a great marketing option. Below is a list of some of the features for the Direct to Front Page Marketing. Note 5000 retweet bonus gets you some initial Twitter marketing right off the bat. Brian does his best to make sure his Direct to Front Page customers get noticed and get their marketing value’s worth. Blog Engage definitely gives a boost to new blogs and smaller blogs, I can show you that I started up a giveaway blog a few months ago, and Blog Engage is the #2 traffic referral for this site, beating out Facebook even. This is a really small blog so it consider only 428 visits came from referral that is a good ratio from Blog Engage. Blog Engage and it’s peer networks TopBlogged and BlogSERP account for thousands of links to my site in Google Web Master tools. Do you know I met many of my favorite bloggers because of Blog Engage or forged partnerships as a result of us networking through Blog Engage. I know many others as illustrated above who said the same thing, so many times a new blogger comes in and they all have the same goal, how do I get my site noticed, how do I get more traffic, how can I share my message with a larger audience…etc. This of course comes next to how do I make money with my blog. And there is always someone to help out the new comers and share what they have tried, learned and what works for them and doesn’t. New comers can introduce their site and get immediate feedback on how to improve appearance, performance or recommendations for plugins and how to take their site to the next level. I sell WordPress services to clients, and I can tell that literally you can get hundreds of dollars worth of opinions, feedback, support and just general guidance from being part of the Blog Engage community. If you hire or outsource for some of these services, you get them for free from Blog Engage. Recommendations on anything whether you are a Blogger blog or a WordPress blog you can find tips and recommendations from others. Blog Engage also has a constantly growing social media network with a following of more than 10,000 not to mention the countless Facebook groups that get promoted into. This is your chance to get an immediate boost and reach a larger audience for your content. Will Blog Engage Work for Me? Blog Engage still is dominated by bloggers in the Blogging, Social Media Marketing, Affiliate Marketing, SEO and Social Media niches, so if you are in that niche and market you will likely see more engagement and votes on articles than other markets just in general because many bloggers who blog about blogging are going to be looking for this sort of engagement. But technology bloggers, food bloggers, sweepstakes bloggers and more can benefit as well. The categories are growing and if you are in one of those other categories, you completely can dominate the category if you get in and get your articles syndicated. I have been a Blog Engage customer since December 2010, and as you can see, I am a pretty much a big user of Blog Engage. I am the top publisher and top submitted on Blog Engage and have been for a while. This is only because of the RSS Syndication Services that I hold this spot folks, I leverage it like mad and I think it is a worthy return on investment. Notice some of my favorites in those top spots, Ileane from Basic Blog Tips, Karen from Blazing Minds, Tuan Do from Tech Walls, Hesham Fathy from Famous Bloggers and developer of the AWESOME Author hrReview WordPress Plugin too!